The open interest in Bank Nifty has swelled sharply along with the up move and the current open interest in the index is the highest seen since August 2018 suggesting long build-up. Rising for the 9th consecutive day, the NiftyBank zoomed to a fresh record high as it surpassed the crucial psychological level of 30,000 to hit a fresh lifetime intraday high of 30,004 on Friday. The rally in the index was led by gains in Axis Bank, Yes Bank, RBL Bank, Bank of Baroda, ICICI Bank, Kotak Mahindra Bank, SBI etc. among others. HDFC Bank which hit a fresh 52-week high of 2,307 in intraday trade on Friday witnessed some profit taking at higher levels. The NiftyBank witnessed a stellar rally so far in March as the index rose by about 12 percent. It rose from 26,789 recorded on 28 February to a record high of 30,004 which translates into a rise of about 12 percent. Most experts feel that the index after surpassing 30,000 will look for the next target of around 30,200 levels, as NiftyBank continues to make higher highs and higher lows, but after a sharp up move, a round of profit booking could be on the cards. “Bank Nifty made a new lifetime high of 29,885 mark and managed to hold above 29650 zones on its weekly expiry day on Wednesday. It has been making higher lows from past fourteenth trading sessions which suggest supports are gradually shifting higher,” Chandan Taparia, Associate Vice President | Analyst-Derivatives at Motilal Oswal Financial Services told Moneycontrol. “It has to continue to hold above 29500-29600 zones to extend its momentum towards 30,200 zones,” he said. Banking index witnessed one of the sharpest moves in the last couple of years and gained almost 1600 points during the week. With continued buying seen from the foreign institutional investors (FIIs), almost every stock observed sharp gains where IndusInd Bank saw a surge of almost 12 percent during the week. While other private sector banks saw gains around 6 percent. 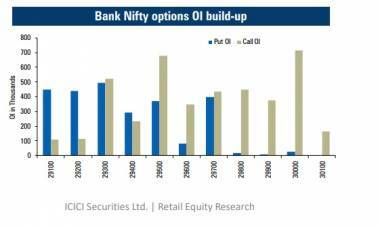 The open interest in Bank Nifty has swelled sharply along with the up move and the current open interest in the index is the highest seen since August 2018 suggesting long build-up, said an ICICIdirect report. In the last week itself, more than 30 percent open interest was added in the banking index. Due to recently formed leverage position and sharp up move a round of profit booking cannot be ruled out, added the report. From the options space, the highest Put base is seen at 29000 strikes for the upcoming weekly settlement. On the other hand, due to sharp upsides, no major Call base is visible. ICICIdirect expects these levels to remain crucial support in the shortened week. Bank Nifty, being the leader of the current move, the price ratio of Bank Nifty/Nifty has also moved to its life high levels of 2.57. Some cool-off towards its previous highs of 2.55 cannot be ruled out in the coming sessions. However, this decline should be utilized to buy the Banking index once again.